Notes: Works with EFI and carbureted engines. Nice upgrade and less expensive than stock replacement. I replaced an aftermarket starter that died with the Powermaster 9182 on my off- road truck. The sales person recommended this starer and He knew what He was talking about. 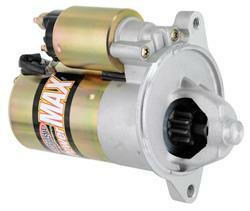 Very good quality and a lot of starting Torque. Easy to install as it bolted right up without any shimming. Electricl hook up was easy also. Great price for a quality part.